Decorated to match your fixture. Larger volume tumbler that matches the BH Soap Dispensers. 4.. Decorated to match your fixture. Larger volume than the other dispensers. 7" high (including .. Decorated to match your fixture. 9-3/4" high (plus brush handle) x 4-1/2" diameter. Ceramic. .. Decorated to match your fixture. Round ceramic waste basket 9-1/2" high, slightly fluted shape .. Decorated to match your fixture. Classic Toilet Paper Dispenser. Over size is 7-1/4" x .. Decorated to match your fixture. Classic Towel Bars come with a 24" bar which be cut to any l.. 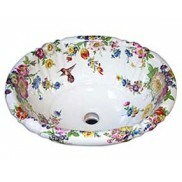 Decorated to match your sink. Plain tumbler/cup. Matches Plain Soap Dispenser. 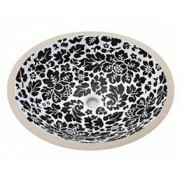 4" high x 2-7/..
Porcelain Faucets decorated to match your fixture. Various handle, escutcheon and spout styles ava.. Decorated to match your sink. Reproduction of Limouges Set. Available as a set. Includes soap.. Decorated to match your sink. 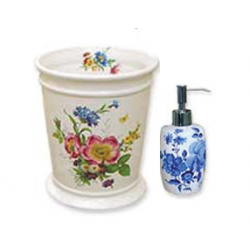 Limouge Style Waste Basket coordinates with Limouges set. Elega.. Decorated to match your fixture. Porcelain Shelves Available in two styles. Contemporary: Small - .. Decorative Scroll Cup/Tumbler. Coordinates with other Scroll Edge accessories. 3-1/2" high.. Decorated to match your fixture. Scroll Edge soap or lotion dispenser. Coordinates with ot.. Decorative Scroll Edge Soap Dish. Coordinates with other Scroll Edge accessories. Oval, 5 .. Decorated to match your fixture. 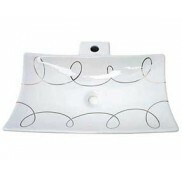 Oval Soap Dish - 5" wide x 4" deep x 1" high. Ceramic. White o..